Over the past 35 years, the mission of Miami-Dade FAWL has been to promote the advancement of women in the legal profession; unfortunately, Bad Judge is a step in the wrong direction. The show depicts a female judge as unethical, lazy, crude, hyper-sexualized, and unfit to hold such an esteemed position of power. In the letter, Baker points out: "A misogynist who believes that women in power cannot control their sexuality, their bodies and their professional or personal conduct would have their views endorsed by this show." In this country, (i) only four of the 112 Justices ever to serve on the Supreme Court have been women; (ii) less than 35% of the active judges sitting on the thirteen federal courts of appeal are women; (iii) only 32% of the active U.S. district court judges are women; and (iv) there are still nine federal district courts around the country where there has never been a female judge. So, maybe let's not make it even harder for women to be taken seriously in leadership positions! 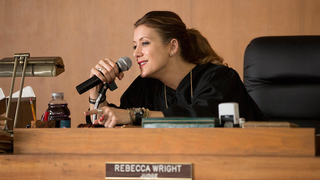 It's likely that Bad Judge is not long for this world, with terrible ratings and worse reviews, but the fact that a seriously un-funny show with questionable moral takeaway has even made it all the way to episode 4 is, frankly, pretty mind-blowing.